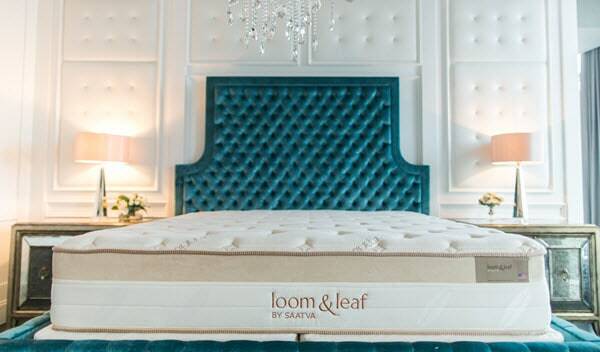 The Loom and Leaf is closely related to one of the most long-lived and well-loved products from the world of online mattresses: the Saatva mattress. 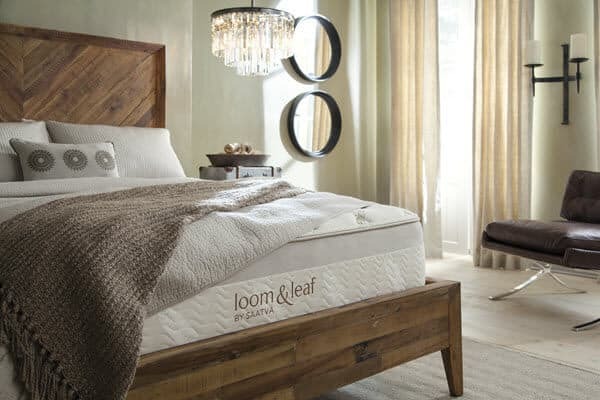 Loom & Leaf began production in 2015 with the goal of providing high-end, high-density memory foam mattresses at a fraction of the $3,000 -$5,000 you’d normally pay for them in a store. Should I Buy the Loom & Leaf Mattress? Like other foam mattresses, the Loom & Leaf is constructed in layers, though it uses four layers, compared to the standard three layers of other foam mattresses. It’s 12” tall total, making it a bit thicker than its closest competition, which averages 10” in height. Top Layer – This layer is for cooling and comfort. It is comprised of 2” of luxury-quality conforming gel foam. The gel is implanted through a “gel-swirl” construction method. This innovative approach ensures that the gel is spread out evenly and is distributed through the entire thickness of the foam. In addition to the gel, this layer also features a cooling gel spinal panel. It’s attached on the top of the foam layer and provides added cooling to help you rest easy. Finally, this layer is constructed with air channels in the foam, which improves breathability and cooling. Second Layer – The second layer of the Loom & Leaf is designed for comfort. It is made from 2.5” of visco-elastic memory foam, providing excellent comfort and contouring, while also lending a hand with support. Third Layer – The next layer in a Loom & Leaf mattress is constructed from 2” of transitional loft pad, and is used for transitional support. It provides a support base for the top two layers, while at the same time creating a transitional support zone to help the base. Bottom Layer – The final layer of the Loom & Leaf is used for support. It is constructed from 5.5” of high-density foam and provides an excellent support base for the rest of the mattress. As you can see, the four layer production method that is utilized by the Loom & Leaf offers a number of different innovations and features designed to provide the support you need out of a mattress, along with the comfort and contouring of more expensive memory foam options. The cover for this mattress is constructed from a quilted, organic cotton. It is a very soft and breathable material, and the texture is pleasant. The cover is also partially made from natural thistle, which is resistant to flames, and gives the mattress an added safety feature. The design and the function of the cover are both brought out by the quilting pattern. It is thicker towards the middle and thinner as you move away from the center of the mattress. The result is better support for your midsection while you sleep. Furthermore, the cover also helps provide support for the lower back and torso areas. This can help sleepers who have a hard time because of spinal alignment, or find themselves waking up with back pain. The look of the cover is quite nice and speaks to the high quality and sense of style that goes into the Loom & Loft’s construction. The handles along the side make moving the mattress or picking it up to put on a fitted sheet rather easy, and the tan side panels with gold trim provide an element of class to the overall design. One of the best features about the Loom & Leaf is that it comes in two different degrees of firmness. The two different options are Loom & Leaf Relaxed Firm, and Loom & Leaf Firm. On a scale of 1-10, with 1 being least firm and 10 being most firm, the relaxed firm option comes in at around a 5.5, making a good, neutral choice for many sleepers. The firm option rates at around an 8, which is much more firm and more suitable to those who enjoy or require a firmer mattress, but want the feel and comfort provided by memory foam. The comfort provided by the Loom & Leaf is also top notch. This is largely because the mattress features 6.5” of specialty foams and gels compared to the 3-4” that are most common among foam mattresses. As a result, the initial sensation is very soft, and then the support layers react to the pressure created by your body. 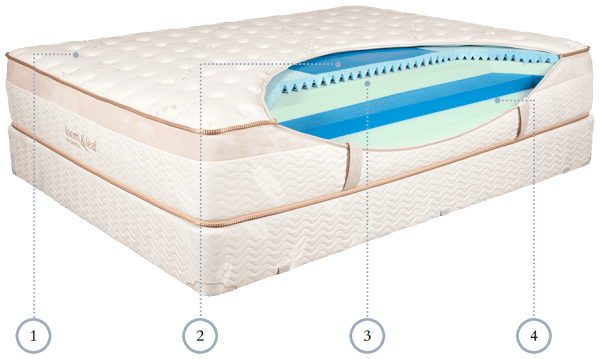 Furthermore, the quilted cover includes 5/8” of foam, which helps create the initial softness before the memory foam kicks into action. The memory foam used in the Loom & Loft doesn’t hug your body as tightly as traditional memory foam does, but there is still sufficient contouring to create a nice little pocket for yourself. We tried the Loom & Loft in all manner of sleeping positions, and we found that it works well no matter how you sleep. This is especially true given the extra mid-section support that is afforded by the cover. The overall support is good on your side, back, and stomach. This speaks well of the Loom & Leaf’s ability to provide pressure relief no matter how you prefer to sleep. There isn’t much motion transfer to speak of when it comes to this mattress. The comfort foam and memory foam layers are quite thick, which aids them in dispersing energy so that partners won’t disturb each other by changing positions in the night. Organic cotton and thistle cover provides a high degree of breathability. The cooling gel pad attached to the top layer of foam helps distribute heat away from the sleeper. Convoluted foam in top layer creates air channels within the foam itself for improved breathability. We use five different sinkage test to give you the best information to how your mattress will react under pressure. The sinkage measurements we obtained were found using a 140 lb adult, so your results might be a bit different depending on how much you weigh. Full on Side – When laying on the side we measured 3.5” of sinkage. Partial Edge Test – When sitting on the edge of the bed so that our whole weight wasn’t resting on the bed we measured 3.5” of sinking. Full Edge Test – Sitting on the edge of the bed and shifting our whole weight on to it resulting in 4.5” of sinking. Standing in Middle – Standing in the center of the mattress with all of the body weight focused in as small an area as possible produced 4.5” of sinking. It’s important to pay attention to what kind of mattresses you’re comparing when you look at prices. Factory direct mattresses can be a couple of thousand dollars cheaper than a comparable mattress from a brick and mortar store, so to get an understanding of the value you get, it’s best to compare the Loom & Loft to other factory direct mattress options. 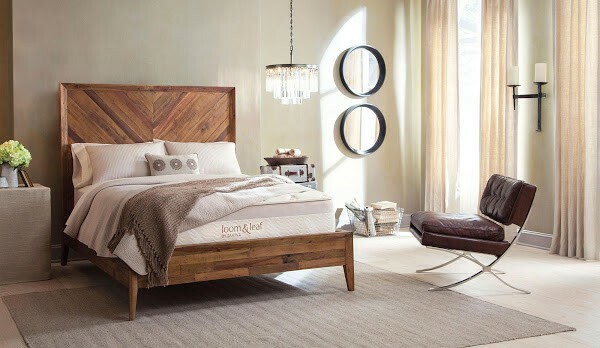 The Loom & Leaf is an excellent choice for most sleepers, especially since it comes in two different degrees of firmness. It’s best for people who want a medium firm to firm feel, enjoy memory foam, want great cooling ability, and prefer the use of natural products to chemical products for their mattresses. At the end of the day, the Loom & Leaf achieves the goals it set out to do; deliver a luxury mattress priced at a fraction of the cost you’d expect to pay in a store. It is made from some of the best materials around, has a wonderful look and feel, and a price point that almost can’t be beat.